← Ed Miliband Leader of the Left? Professor Noam Chomsky the world`s leading public intellectual viewed by some as a wild-eyed radical is actually an old fashioned conservative. He is committed to the traditional values of Magna Carta, a document that shaped the Anglo-American legal system, ultimately establishing a presumption of innocence and the right to a fair trial. With this thought in mind, it is worth considering how traditional conservative ideas are today viewed as radical in both the USA and UK. As we know the Conservative Party in opposition went through a re-branding process as Cameron appeared to move his party leftward and in doing so rediscovered the Conservatives civil liberties antecedents. When the coalition government was formed, one significant judicial appointment was that of Dominic Grieve MP who, as Shadow Justice Spokesperson, was viewed as a politician with strong civil libertarian credentials he became Attorney General and the Coalition`s chief legal adviser. In a lecture given in 2008 Mr Grieve outlined what he saw as the essence of what it means to be British, extolling the virtues of freedom waxing lyrically about Magna Carta and the Glorious Revolution of 1688. But he was concerned that New Labour was dismissive of this heritage, as evidenced by restrictions of jury trail and permitting unacceptable periods of detention without trial. Grieve felt that the pendulum had swung too far and that the climate created by New Labour was one of tyranny. Labour he argued breached the ideals of the Bill of Rights and undermined the notion of Habeas Corpus. Grieve together with the Shadow Justice Minister, produced a policy document called `Reversing the rise of the surveillance state 2009`. Outlining concerns about a perceived reduction in citizen`s civil liberties in an eleven-point programme. Grieve now resides in a government that has generated concerns about civil liberties and Cameron has recently demonstrated the Tories have forgotten what Magna Carta means. It is interesting how parties discover civil liberties when in opposition – Ed Miliband is currently on a civil liberties road to Damascus. This could be history repeating itself, after all the Labour Party in opposition were vociferous critics of the governments civil liberties agenda between 1979 and 1997 and the drive for constitutional reform became a hallmark of New Labour`s formative years in power after 1997. But as Michael Mansfield QC points out in his memoirs Labour in office were as adroit in eroding the civil liberties of UK citizens as the Tories. Such concerns about erosions in civil liberties are evident in the USA, as Chomsky made clear in a wide ranging radio discussion with David Barsamian. Although as Chomsky outlined when discussing WikiLeaks, the USA is one of the most open societies in the world, with relatively fair access to declassified documents. The broadcast covered a lot of ground, topics including Daniel Ellsberg, and this led the discussion to Bradley Manning, who has been charged with passing materials to WikiLeaks. In Chomsky`s view Manning`s case indicates a breach of due process as Bradley Manning has been held incarcerated in solitary confinement, which is essentially torture. Further, the erosion of the presumption of innocence is clearly evident in this case as is (until recently) the lack of a trial. Barsamian asked about the stance Obama had taken on this issue, the President is after all a former Constitutional Law Professor. Chomsky informs us Obama`s stated position is that Manning was “guilty and this is unconscionable.” The recent information coming out of Bradley Manning’s pre-trial hearing this week from the Guardian indicate he spent nine-months in Quantico in the brig resulting in protests from the UN and Amnesty International. The Guardian also reports that pre-trial punishment is prohibited under Article thirteen of the Army Code. Manning apparently has been held under a “prevention of injury” order with suggestions that this has been prolonged. The USA has shifted so far right argues Chomsky that there is a convincing argument to suggest that Richard Nixon was the last liberal President of the USA. An amazing assertion given Nixon`s legacy. But Chomsky illustrates that right-wing republicans are currently campaigning to repeal measures introduced by Nixon. Such as the Clear Air Act and the Environmental Protection Agency, Nixon (an avid admirer of Disraeli) even attempted to introduce a `guaranteed income`, a policy that despite its association with Milton Friedman would today appear progressive. 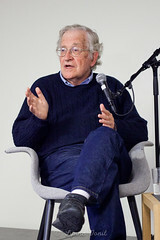 Barsamian asked Chomsky about the political position of the `Occupy Wall Street Movement`, with concerns about a perceived authoritarian approach by the Police who we are told are increasingly resembling `special operations forces`. Chomsky pointed out that in the past it was worse, reminding us of the actions of Attorney General Mitchell Palmer under liberal President Wilson during the USA`s first foray into a `Red Scare`. In more recent times Chomsky gave us the example of Cointelepro. Marr: Sorry you will need to explain that to me. Chomsky: It is interesting that I have to explain it because it`s vastly more significant than Watergate. Cointelepro was a programme of subversion carried out not by a couple of petty crooks but by the National Political Police the FBI under four administrations it began in the late Eisenhower Administration. Marr: This is aimed at the SWP? Chomsky: The SWP is only one tiny fragment of it by the time it finished it was aimed at the New Left, Women`s Movement and Black Movement. It was extremely broad its actions went as far as political assassination. Ironically, the worst aspects of this programme arguably took place under Nixon estimates vary but reputable historians (who dedicate little to it) suggest at least twenty-eight members of the Black Panthers were killed during this time. The policy appears to have been a malevolent feature of the `Imperial Presidency` although very little is ever heard or written about it but Chomsky always fills in the gaps.